Hello Friends! I am so happy that Autumn is here! It's such a beautiful time of the year. 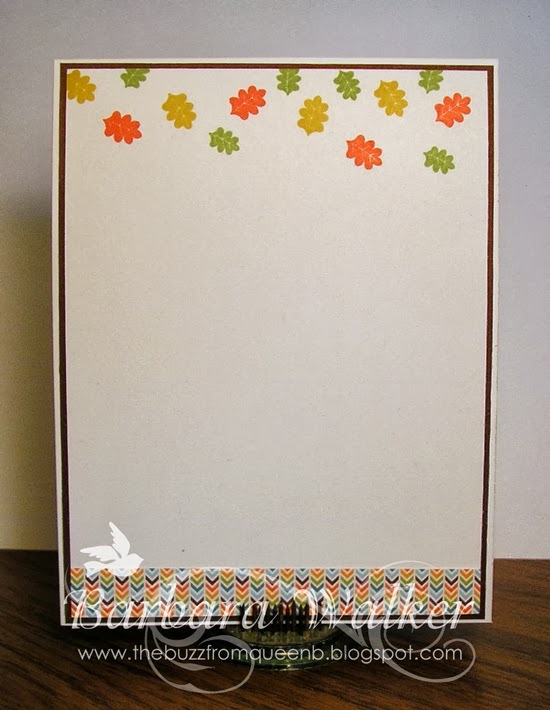 Today, I wanted to play with my Grateful Heart Stamp TV kit. 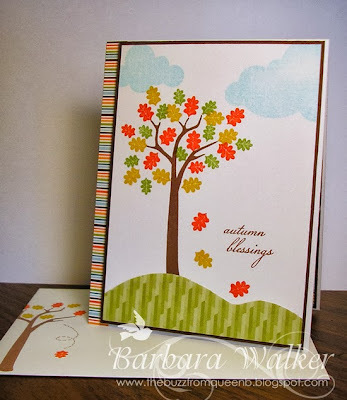 I just love the Autumn Blessings stamp set that is included in the kit. There are four individual leaves in the set and I LOVE that, because I can make each leaf a different color. I used two GinaK Designs inks for stamping some of the leaves. I am REALLY liking it! 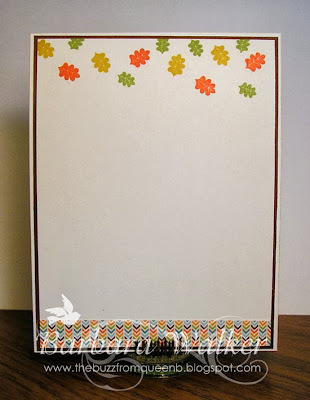 The colors are very vibrant and they give great coverage on both cling and clear stamps. 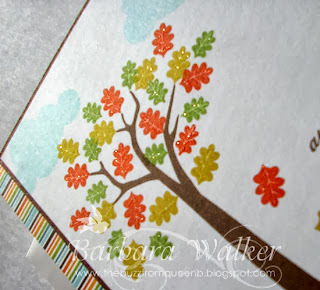 After I stamped the leaves on the focal, I added a tiny bit of sparkle to the veins. Now you all know that I cannot create a card without my signature sparkle added somewhere! I used a clear Wink of Stella glitter marker for this. These markers are FAB-U-LOUS and VERY inexpensive. They can be used for coloring, writing or for accenting images, like I've done here. That's all for me today. I thank you so much for dropping by. Have a good one! 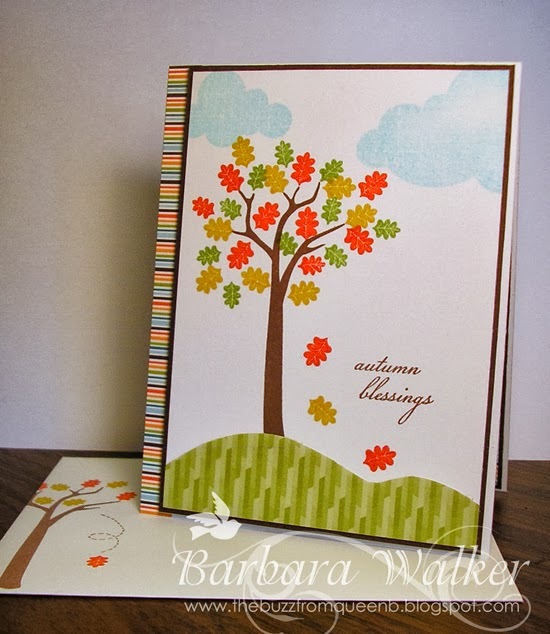 I love the vibrancy of the colors of the leaves, Barb. Your DP is beautiful. 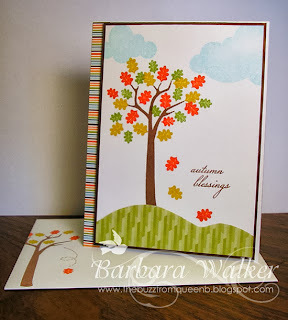 This is a lovely autumn inspired card. First of all, I really like your blog heading. Great reminder but not intrusive! Great job! Now about your card...absolutely stunning! LOVE the simplicity that packs such a great punch. The colors in the leaves, along with the bit of sparkle, so eye catching. Love the inside and that envelope. The whole package is just lovely. Excellent work, my friend!